Born in Chicago, but growing up in Flint, Mich., Anni Crouter started painting and drawing before she could read or write. 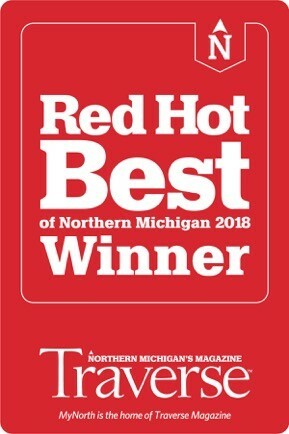 Soon after relocating to Michigan in 1965, this natural ability caught notice by her mother and both her grandmothers, who encouraged her to express herself. 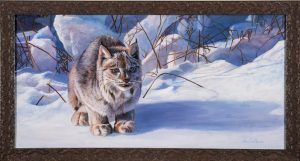 The life on a farm in rural Michigan with a father who was a veterinarian lent itself to many aspiring subjects to paint and draw such as horses, barn cats, dogs, birds and other wild and domesticated animals. 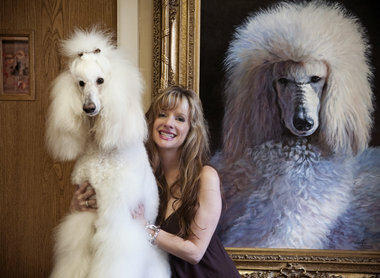 Many of these subjects still remain her favorites to paint. Following school, she attended Mott Community College majoring in business, with a minor in art. Her artwork mainly focused on oil, and sometimes, acrylic mediums. Her big breakthrough came with the introduction into the world of watercolors. She credits her longtime mentor, Jim Ames, AWS. 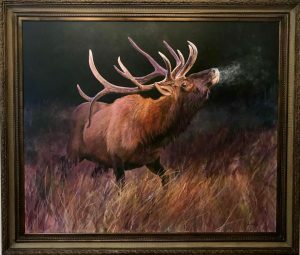 Under his guidance her knowledge in art theory and artistic abilities has continually progressed, and now her work can be seen in national and international trade journals, art galleries and businesses in several states, and in the homes of private collectors. 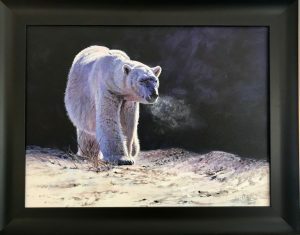 Her painting, “Polar Expressed,” a trio of three separate works each measuring 72 inches long by 48 inches high, won second place in the 2013 ArtPrize competition in Grand Rapids. Anni married Dr. Nathan Boggs, DVM in 2001. 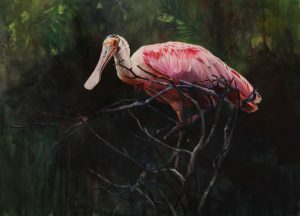 They currently reside in Flint, where she shares space at her husbands’ practice — he fixes them on the ground floor and she paints them in the studio located on the second floor. It seems that when you love your subjects so much, you make sure that you are around them as much as possible. 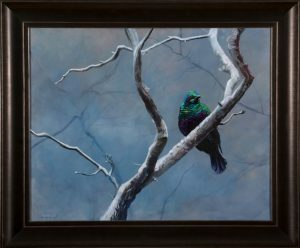 Anni Crouter’s love for animals and color is abundant in Emerald Starling. 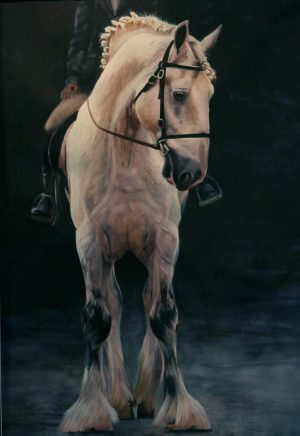 “His Majesty” is a stunning large format acrylic by award-winning artist, Anni Crouter. 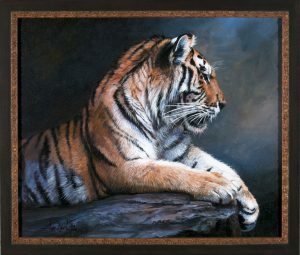 The beautifully framed work captures the animal’s magnificence, power and presence in vivid detail. 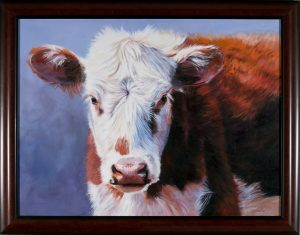 Anni Crouter’s “Moo To You,” captures the spirit of our beloved bovines. The detail and realism of Winter Solstice by Anni Crouter never cease to amaze. The look in the cat’s eyes is hauntingly beautiful.